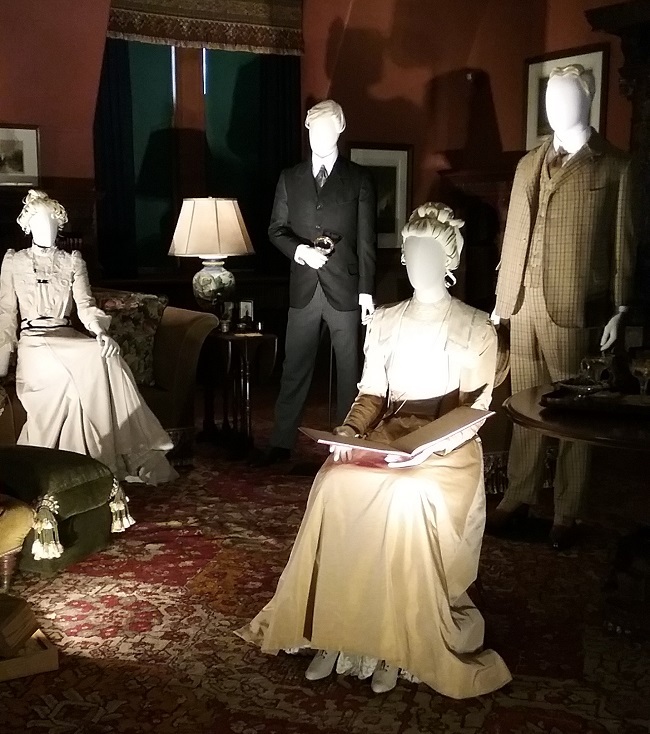 For the past several years, Biltmore Estate in Asheville, NC has partnered with Cosprop to mount a costume exhibition in the house. 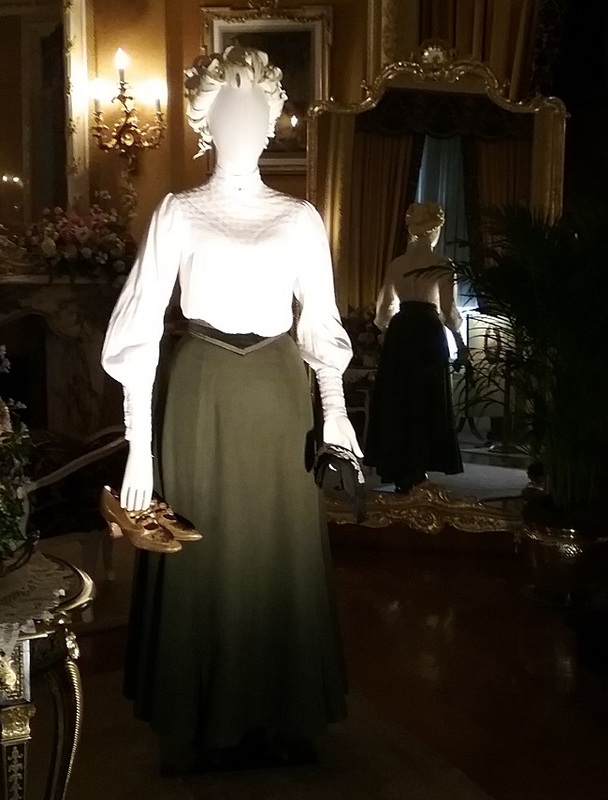 Previously they have displayed costumes from Titanic and Downton Abbey, one year they displayed movie wedding dresses, and another, dresses from films inspired by literature. This year’s fashion exhibition was a bit different, and more ambitious. 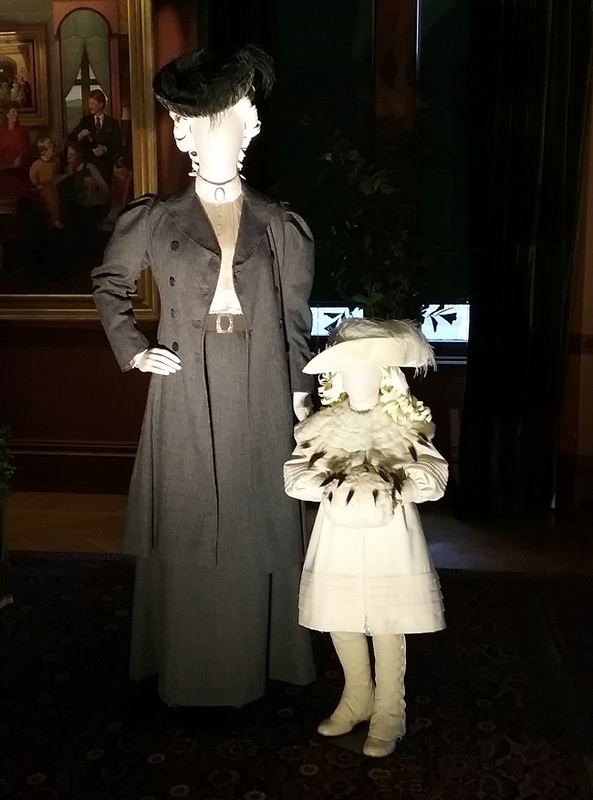 Cosprop was hired to reproduce some of the actual clothing worn by the Edwardian Vanderbilts, the owners of the estate. To do this, photos were studied, along with other records such as newspaper accounts, letters, bills of sale and other family documents. It’s not entirely possible to know exactly how a garment that had long ago disappeared looked, especially as to color, but enough evidence was uncovered to give John Bright of Cosprop the information needed to recreate quite a few looks. 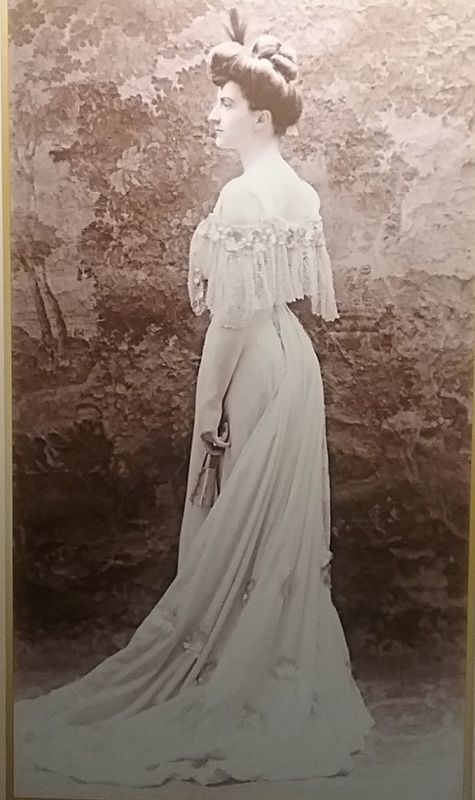 In the cases where clothing was recreated, the photos on which they were based was displayed along with the garments. 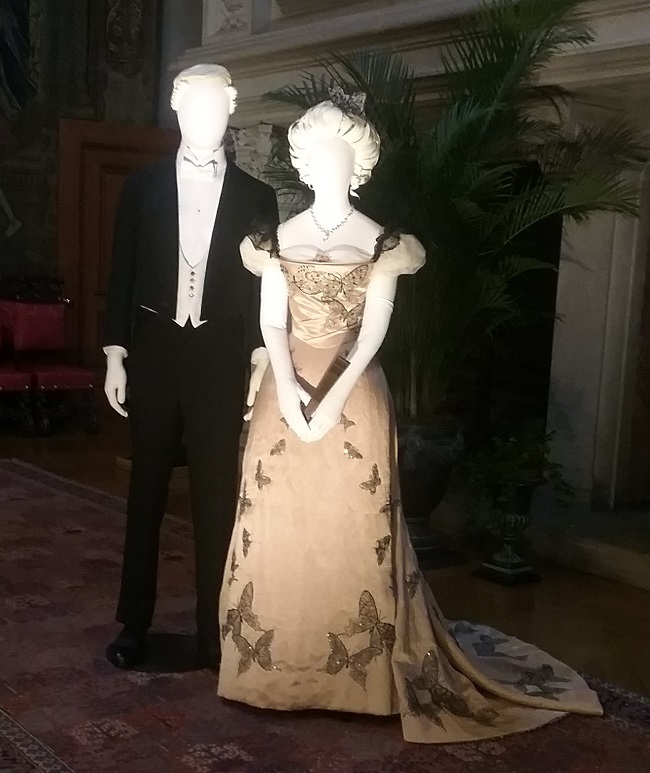 The couple above is Adele and James Burden, two of the first visitors to Biltmore, soon after George Vanderbilt moved into the house in 1895. Adele’s blouse was beautiful, but the sleeves look a bit deflated compared to the photo of her wearing the blouse. This was, after all, 1895, the era of the huge puffed sleeve. We sort of joked that James’s ensemble can still be bought today at Ralph Lauren. 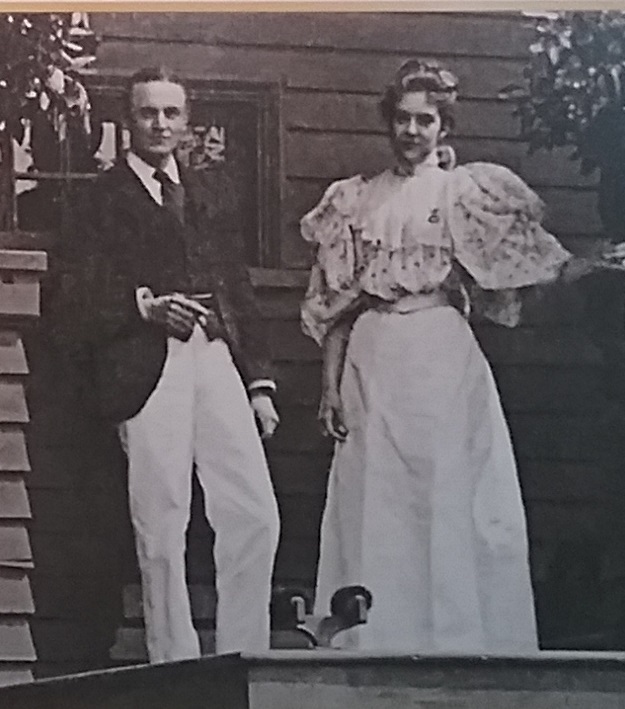 Most people can’t really relate to the fact that this was George Vanderbilt’s country home, and that the dress code there was much more casual than you would find in a house belong to the robber baron class in New York. There is a multitude of photos showing the Vanderbilts in outing attire. That’s George, ready for a walk around a small part of his estate. There were several of these tweed and boots ensembles for men on display, but I was surprised that there was no real woman’s walking ensemble represented. 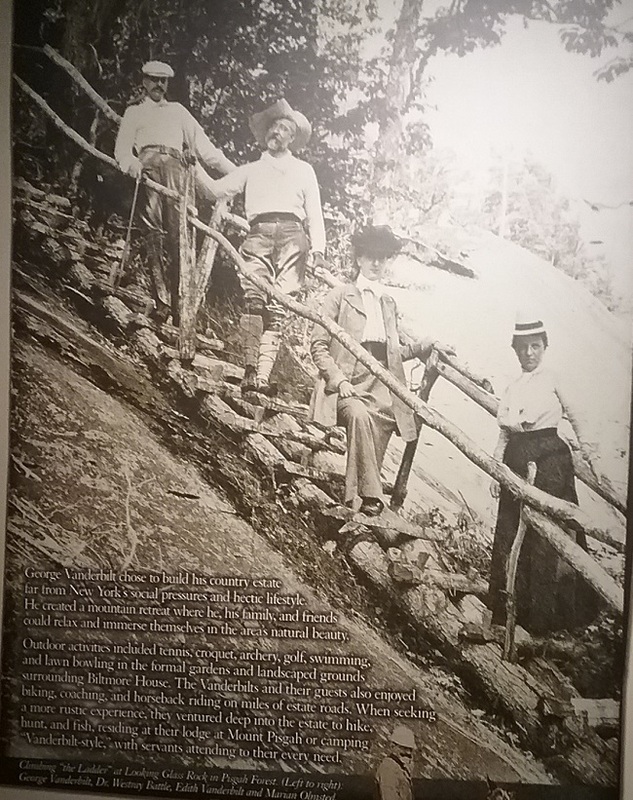 Outdoor activities were a big part of what went on at Biltmore, with trails galore, even one that stretched the fifteen miles to the Vanderbilt’s hunting lodge. This is the photo from which George’s tweeds were modeled. That’s daughter Cornelia before a swim, 1910. When George Vanderbilt planned and built Biltmore, he was not married. He met and married Edith Stuyvesant Dresser in 1898. Their only child, Cornelia, was born in 1900. 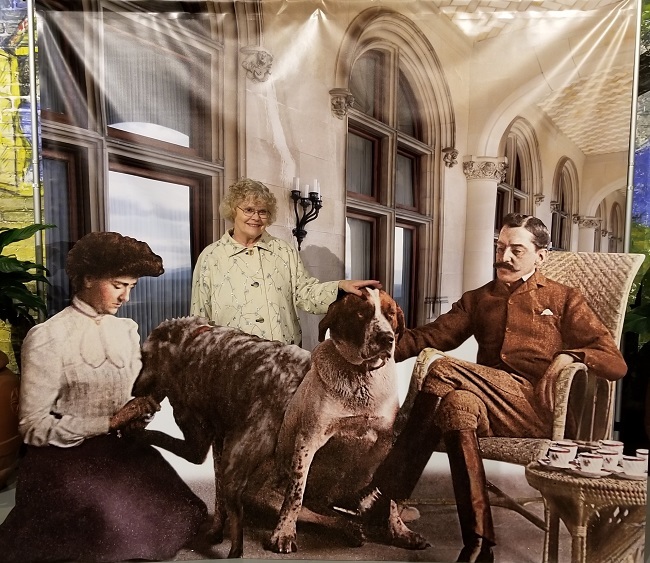 In the above vignette, George’s suit was reproduced from a photo of him taken in 1900, but “Edith’s” dress was borrowed from another Cosprop project, the 2000 film, The Golden Bowl. 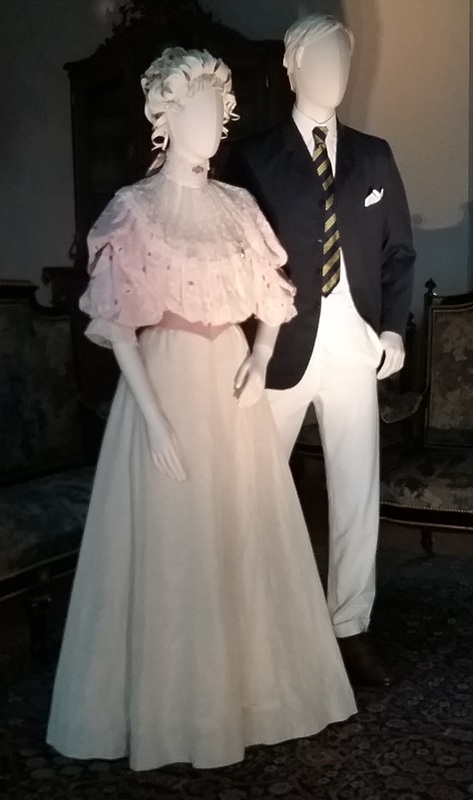 Quite a few of the garments in the exhibition are Cosprop products that were not specific to Biltmore. I don’t know why the decision was made to include these garments, but I suspect it was because of the expense. It’s a lot cheaper to rent an existing dress than to make a new one. 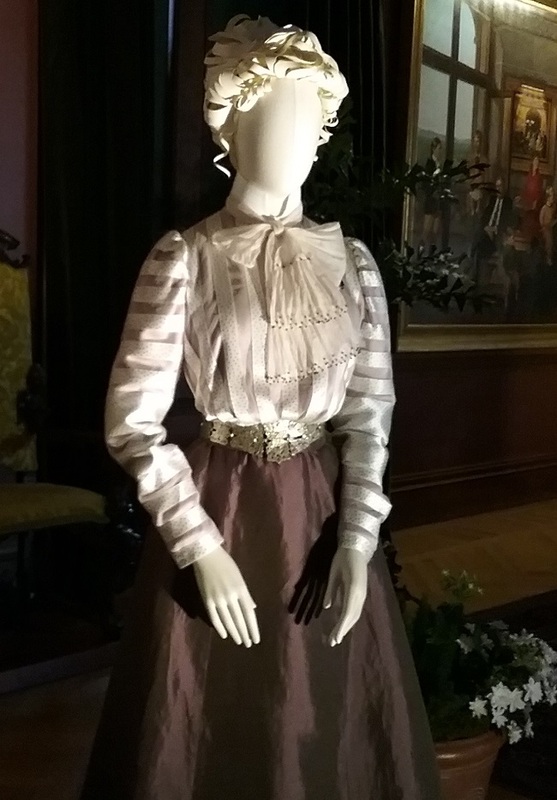 This lovely waist and skirt were recreated from a 1900 photo of Edith. To me, this was probably the most effective recreation, with the design team going so far as to screen-print the exact pattern of the dots on the ribbon stripes of the blouse. There was an interesting little video for visitors to explain how many of the design decisions were made. Even though this is based on a black and white photo, through research they were able to determine Edith’s favored color palette, and to make a good guess at the actual colors used. Here’s another recreation from a photo. 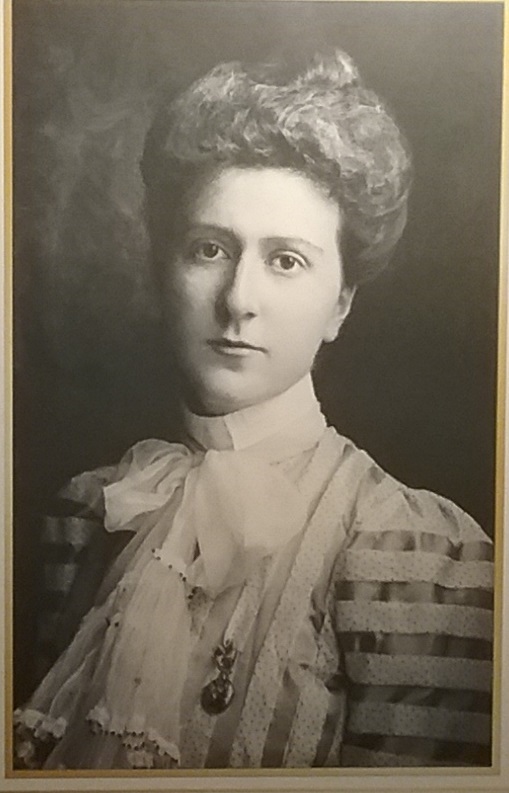 This is Edith just before her marriage to George in 1898. Her waist looks much more corseted in the photo. Here’s another pretty waist and skirt combination. If it looks familiar, that’s because this was designed for the 1985 film, A Room with a View. 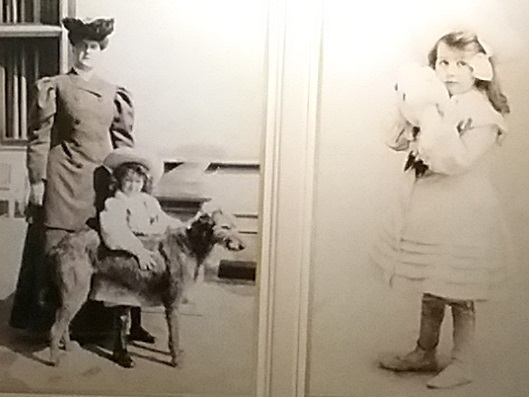 Let’s not forget that there was a little girl in the house, and this setting was based on a 1904 photo of Cornelia and her aunt, Pauline Dresser Merrill. I really love Pauline’s travel ensemble. Unfortunately, they left out Iwan the wolfhound, who was in the original photo. And here is Cornelia again, along with her cousin John Brown. Not only were the Vanderbilts and their guests represented, but we get a glimpse of the staff as well. Here is the gentleman’s gentleman getting out Mr. Vanderbilt’s motoring accessories. 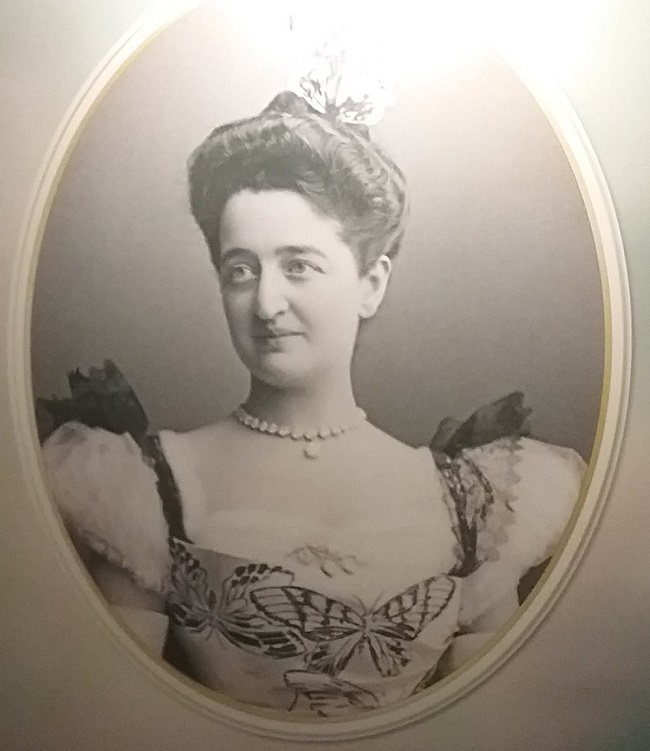 And this is Martha Laube, Mrs. Vanderbilt’s lady’s maid. A group of guests have made themselves comfortable in the third floor living hall. And just down the hall a maid is busy unpacking a visitor’s trunk. Much of the third floor was for house guests. The basement had multiple functions. Here was located the kitchen, the laundry, and the food and serving supplies storage. 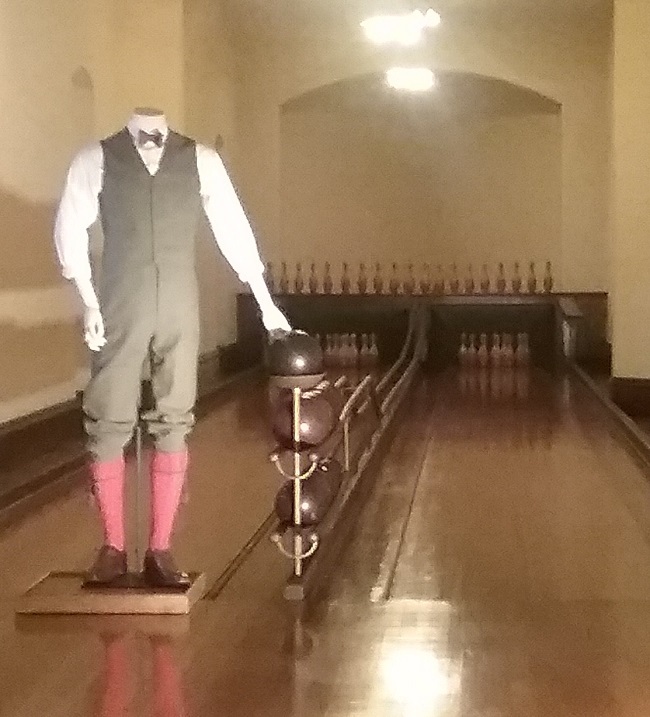 It was also the location of recreation rooms, including this bowling alley. Past the bowling alley and a line of changing room is the indoor pool. 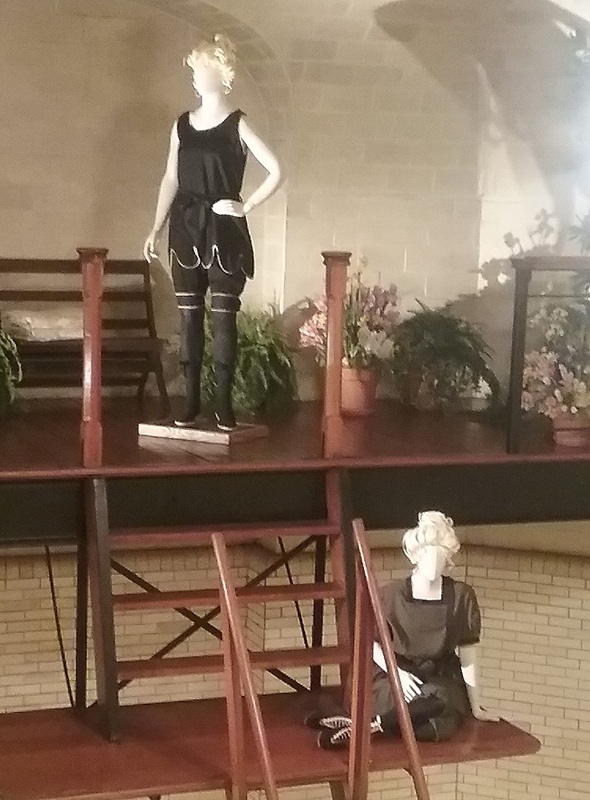 Here on the diving platform are two bathing suits that probably would have never been seen together, The one at top is circa 1920, and the one at bottom is ten years older. Both are a bit too new to fit in with the rest of the clothes on display. This gymnastics girl was right on point. I would have loved to get a closer look at her shoes. Which leads me to one of my issues with Biltmore clothing exhibitions. 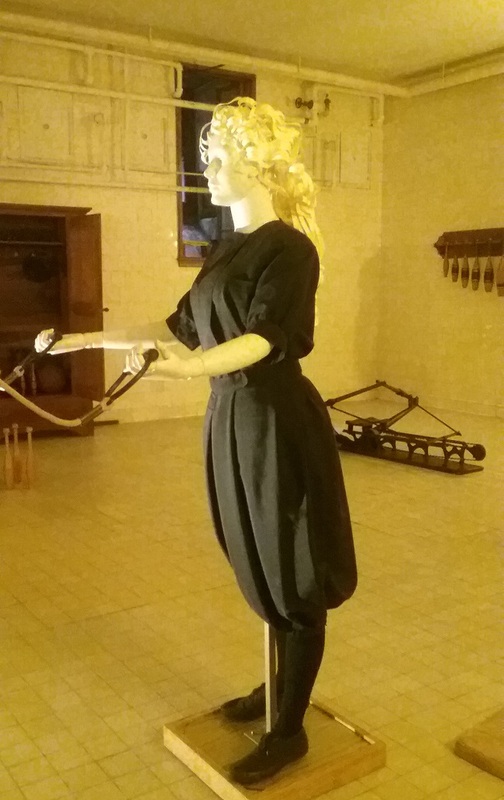 The clothes were just out of range to get a really good look, I could not tell if these were antique or newer that just look old. After the trek through the basement, the tour planners wisely bring the visitor back to the fancy side of things by going back to to the first floor and the magnificent banquet hall. This is where one “dressed” for dinner. 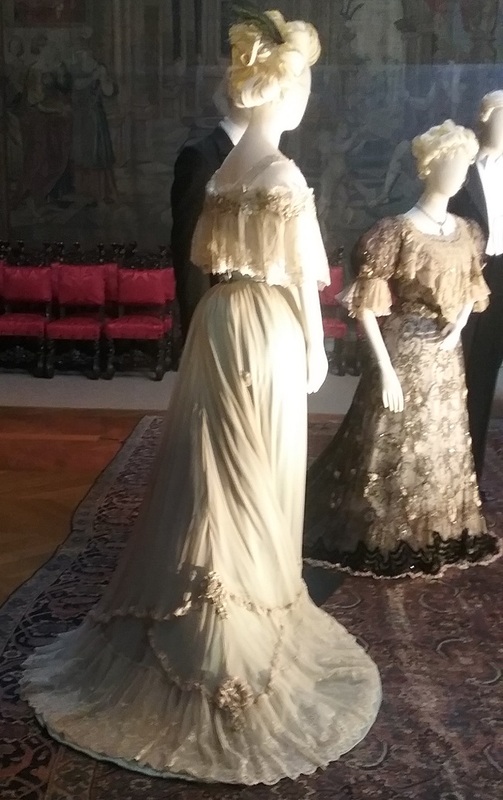 Above we see the recreated Worth dress of George’s sister, Florence Vanderbilt Twombly. 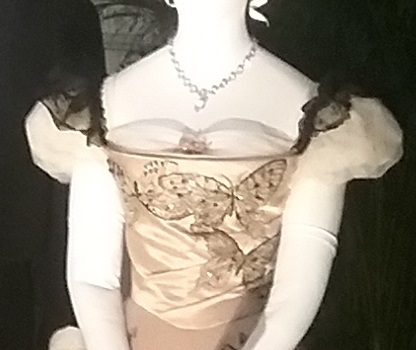 Also in the banquet hall was this dress, worn by Edith in 1903. The dress in the background is from Cosprop’s inventory. 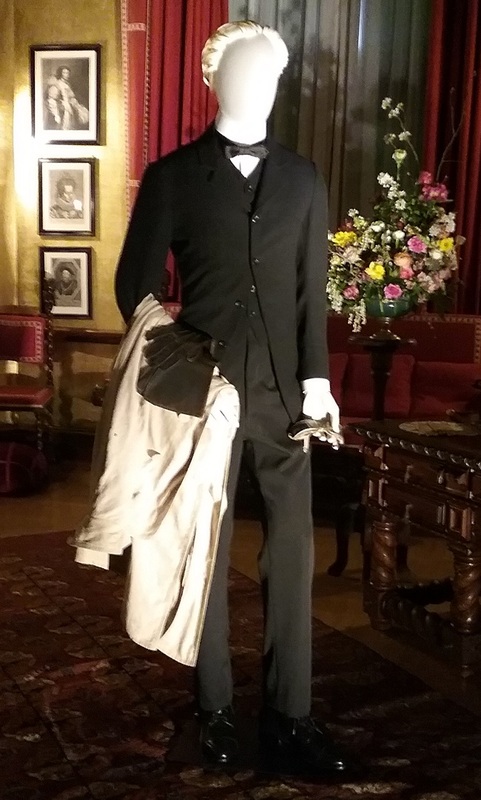 If you visit Biltmore, be sure not to miss the Legacy Museum located near one of the hotels. They do changing exhibitions, with the current one being on travel and recreation. The notes on this motoring duster were not exactly clear, but I am pretty sure it is antique, as is the Louis Vuitton trunk. 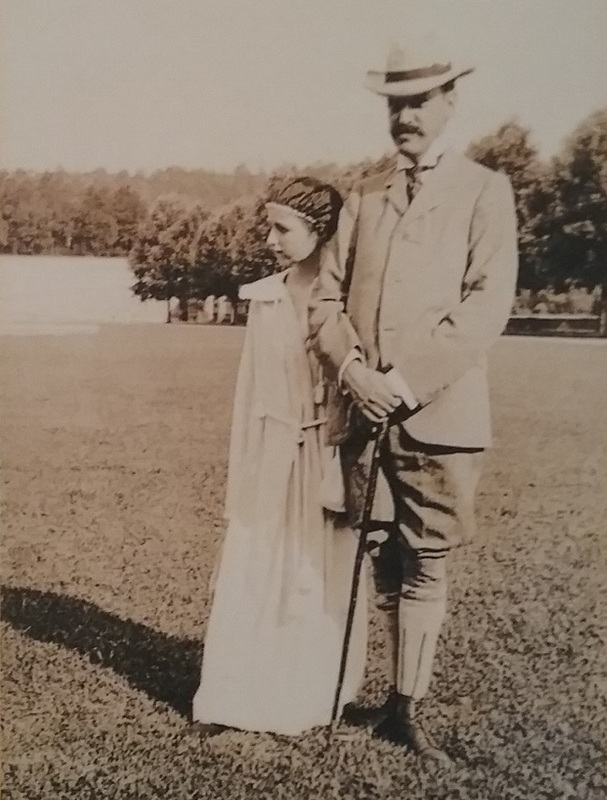 There were also lots of photos showing the Vanderbilts and guests at play on the estate. I wish they had recreated Edith’s outing suit. I really appreciate that Biltmore has a commitment to doing a costume show every spring. Tickets are not cheap, but they really do try to make the visit as aesthetically pleasing as possible. The floral arrangements alone are worth seeing. 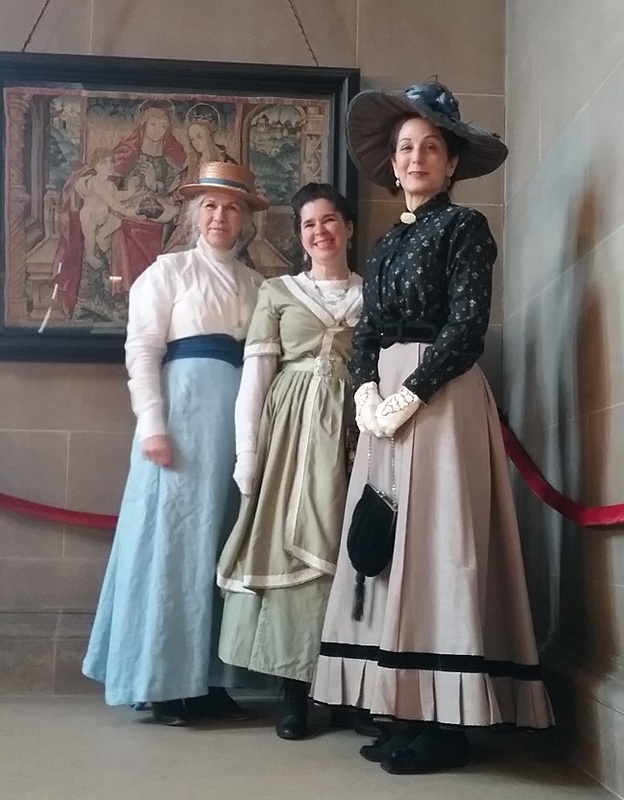 And if you go, why not try the most appropriate dress, as these members of Atlanta Time Travelers did? That’s my friend Liza on the right, along with Randi and Bobbie Jo. Their attire enhanced everyone’s experience! Finally, here I am with Edith, Iwan, Cedric, and George. 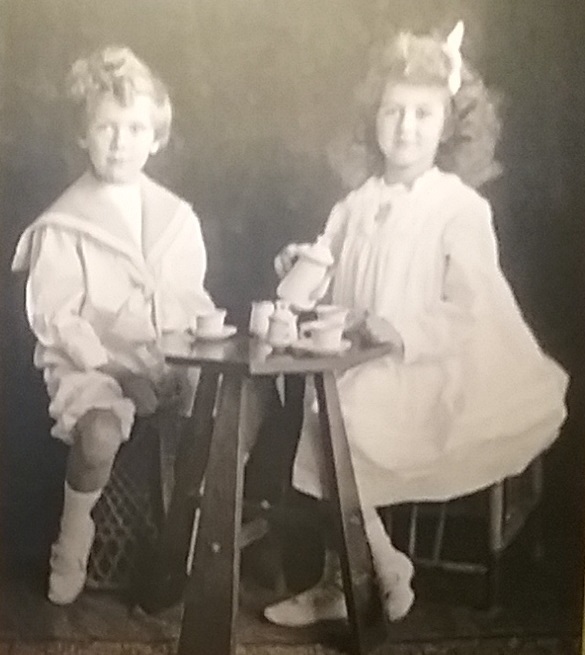 The photo prop was based on an actual photograph from 1903. Thanks to Liza for the photo. Absolutely lovely post. Thank you for documenting this. When I was at Duke during the late 70’s, there was a bowling alley in the basement of the Union on East Campus. I wonder if it is still there. Lizzie! You little show stealer!!! Love the photo! Thank you for the tour. 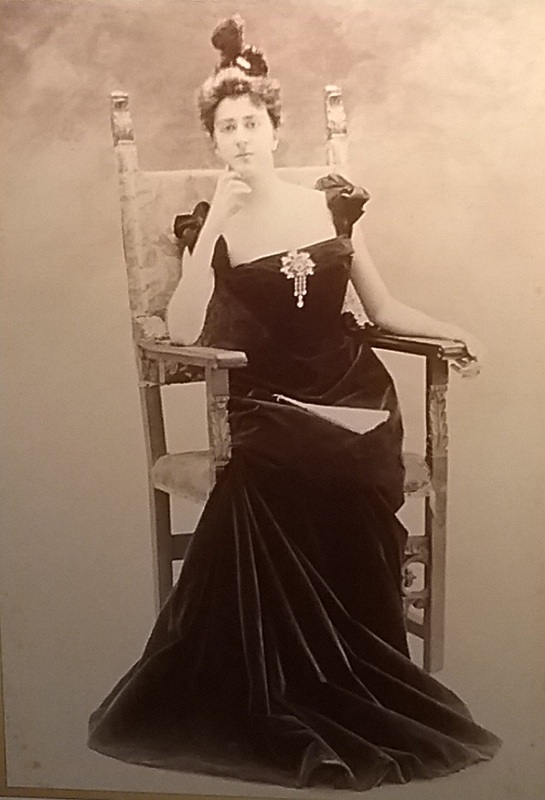 The photo of Edith ( black evening gown seated) very belle epoch . Do you know who the photographer was? Thanks for the compliment! As for the photo, I’m afraid the photographer was not credited in the show notes. Thank you for this visit ! And congratulations for your coat. 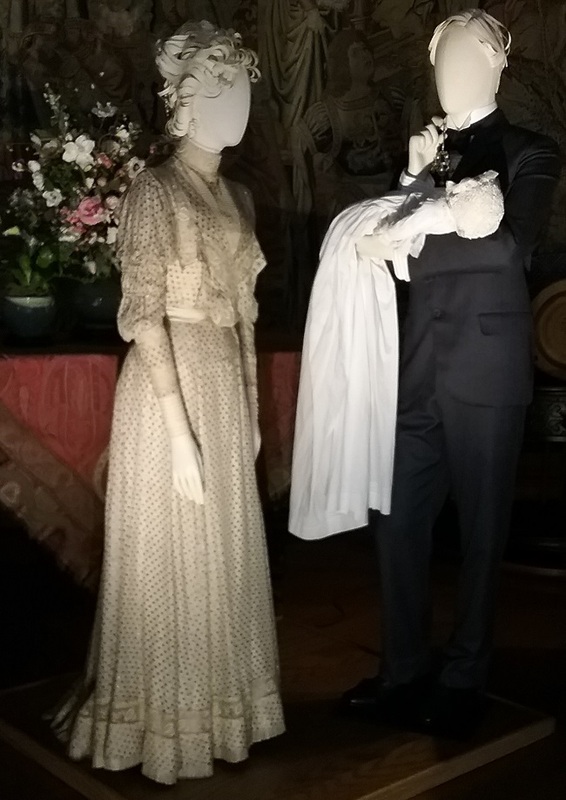 I wonder about the real clothes the Vanderbilts wore on the pictures : it’s great to see them recreated, but were they not kept, none of them ? That’s an excellent question. 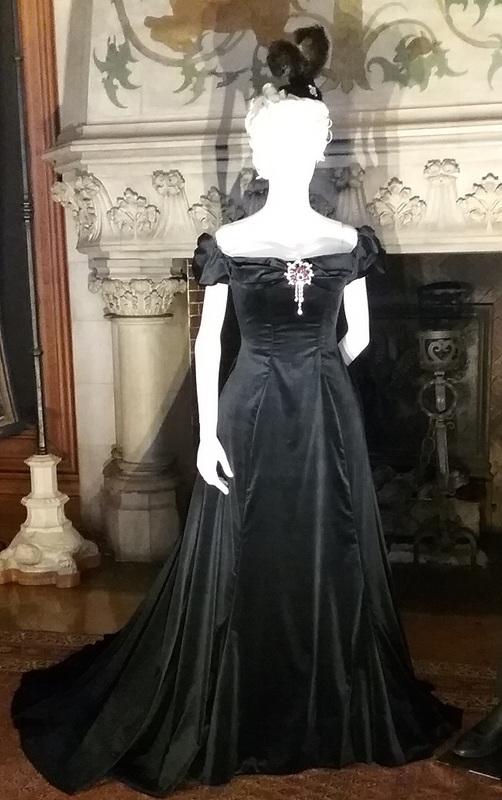 Some of Edith Vanderbilt’s clothing, mainly from the 1920s, ended up at Rhode Island School of Design Museum. There’s some real plums in that group, but interestingly, not the Lanvin dress Edith wore to Cornelia’s wedding. The family owned multiple homes, including mansions in New York and Newport, and estates on Long Island and Staten Island, so the clothes would have been in various places. 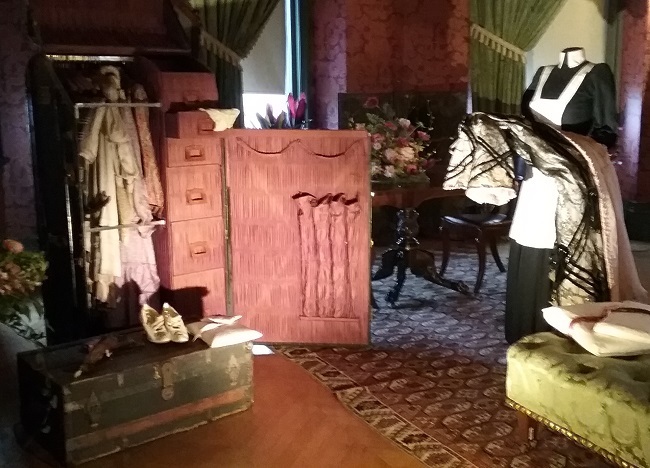 Several years ago I went on a curator-led tour of the house for members of the Costume Society of America. 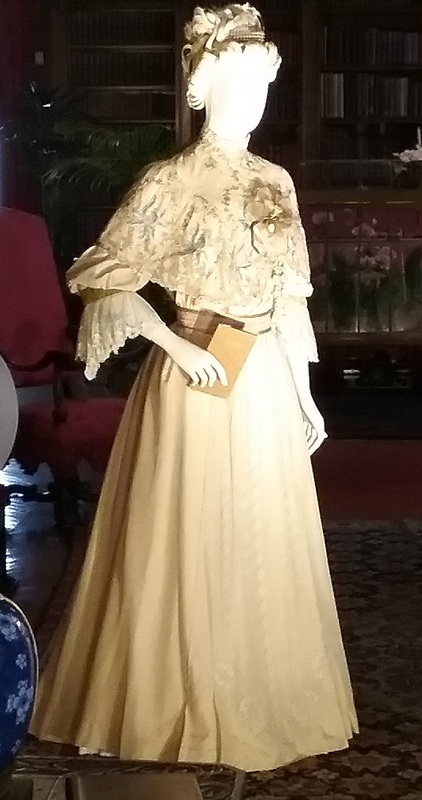 At that time Biltmore was buying Gilded Age clothes to display in the house because there were none of the original Edwardian clothes there. They do have some 1920s dresses and lots of accessories. Even Cornelia’s wedding dress is mia. Several years ago Biltmore had Cosprop recreate it. They do have her shoes, and the antique lace veil survives. Lots of fun! And isn’t that your new coat? Yes, it is! Thanks for noticing. I love wearing it – so comfortable. 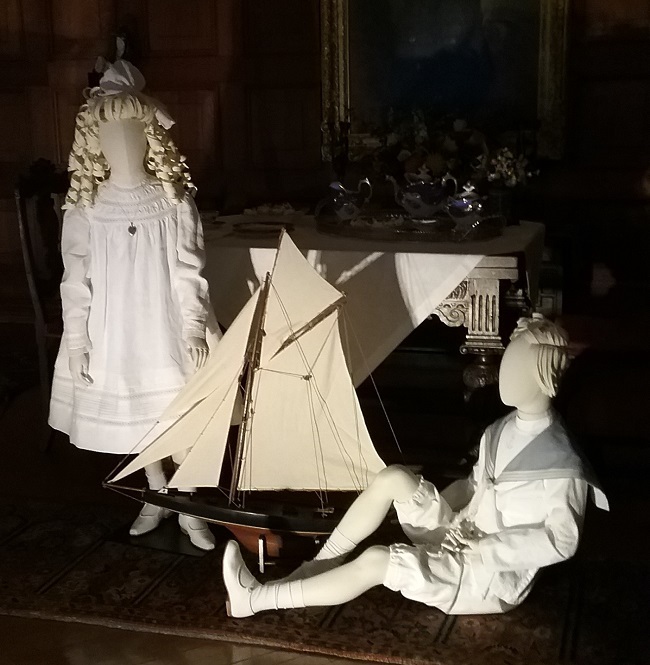 It was wonderful to meet you and tour the house with, Lizzie, which is always a pleasure…always new things to see. And the same to you, Randi. We had a great day! Thanks as always for the detailed post. 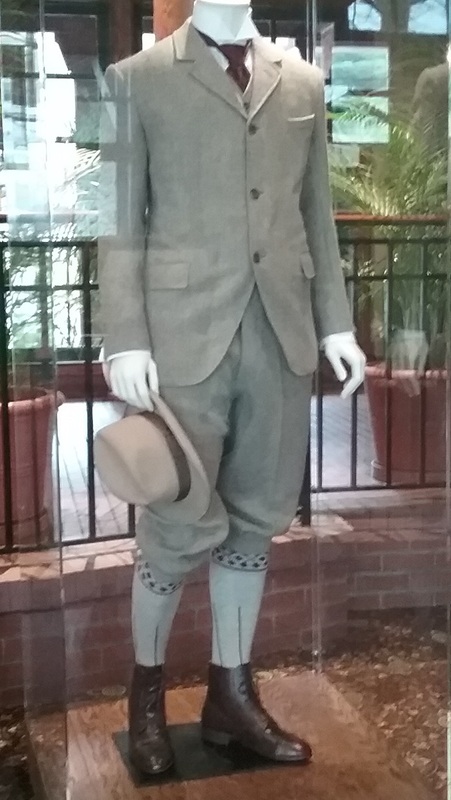 Question about the Atlanta Time Travelers – am I remembering correctly that some museums/historical sites prohibit period attire on guests? 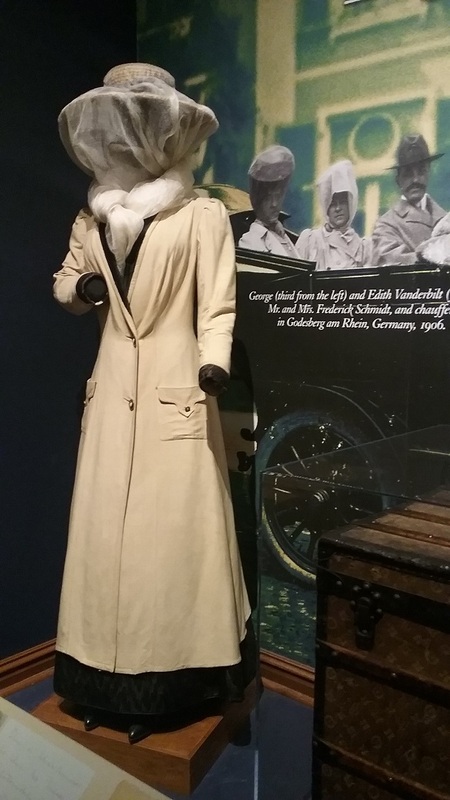 Did the Time Travelers need to obtain permission beforehand to dress as they did? As a California resident I never made it to Biltmore, and I now live in France, so I may not get there at all. Love this snapshot from you, and the photo with the family is great, especially the dogs. I have a feeling there are plenty of pretty and historic houses for you to visit in France!